Congratulations to Randy for his Level 3 Certification! Congratulations are in order! SARA Member Randy Shanyfelt successfully completed his Level 3 Certification flight at Tripoli San Diego's Holtville Havoc launch March 2, 2019! Randy's Cinco de Sober stands 10 ft 10 inches tall, 5.5 inches diameter, weighs 42 lbs on the pad, and flew on an M1160 green motor to 6984 ft with 2 onboard video camera pods. And if you haven't seen this rocket up close, it's one of the most original designs you'll see. Styled after Mountain Dew, it features a nutritional info card with the rocket specs, a photo of Randy's little Pomeranian dog Lilly wearing a sombrero, and flies with a ballast of a 6 pack of Mountain Dew! Outstanding job, Randy! SARA has received FAA authorization to operate Class 2 high power rockets from 9:00 a.m. to Noon this Saturday, January 19, 2019, at the TIMPA facility near Picture Rocks. The operating altitude is from the surface of the Earth to 6,500 ft. above ground level. As always, the use of spark producing motors is subject to the Range Safety Officer's review of field conditions. Do not automatically assume that spark producing motors may be flown. SARA's September Member Launch is a go! SARA has received FAA authorization to operate Class 2 high power rockets from 9 a.m. to 1 p.m. this Sunday, September 16, 2018, at the TIMPA facility near Picture Rocks. The operating altitude is from the surface of the Earth to 6,500 ft. above ground level. Note that despite the hot weather, this is our first launch of the season on the winter schedule, with a later start and longer hours. Rocketry Works will be on site with a supply of Estes black powder motors for sale at 10% off for SARA members. You can shop on site with credit card or place your order online ahead of time with free delivery at the launch. Just use the coupon code SARA 2018. Sunday's weather forecast calls for sunny skies with low winds, and temperatures in the 80s and 90s. Be sure to come dressed for a morning outside in the Tucson summer weather, with long sleeves, long pants, closed toe shoes, a hat, sunscreen, and plenty of water! Launch Cancelled June 16 2018 due to rain and muddy range conditions. It is currently raining hard at the SARA launch site, and the field conditions are very muddy. While the rain may let up later in the day, the muddy conditions will take longer to dry, so we are cancelling our June launch. On the plus side, it would have been a great day to fly sparkles! We will pick up launch operations again July 15, 2018 from 8 am - 11 am. SARA has received FAA authorization to operate Class 2 high power rockets from 8:00 a.m. to 11:00 a.m. this Saturday, June 16, at the TIMPA facility in Avra Valley. The operating altitude is from the surface of the Earth to 6,500 ft. above ground level. Weather notice: Weather forecasts for Saturday have been highly variable, but most now point to heavy rains overnight Friday night and again Saturday, although there may be a lull in the rain and low clouds during the 8 am - 11 amplanned launch. I will be at the launch site at 7 am Saturday to make a go/no go decision, and I will reply to this thread and announce on the SARA website and SARA's Facebook page whether or not we will set up launch range. So stay tuned, but my advice is to come out early, help set up, and be prepared for a rain delay or a cancellation. The concern is not just the rain, but the low cloud deck, so don't plan to fly very high Saturday. Remember the safety code mandates that we not fly above the cloud deck. Most low power flights should be fine, but flights over 3,000 ft AGL will likely not be possible. A rain date on Sunday is unlikely due to scheduling conflicts and anticipated windy weather. We had a good day of flying on Sunday, although it did start to get windy toward the end of the day's flying. Nevertheless, we saw a lot of great flights, including 2 certification flights! Photos are available at our flickr site, thanks to Steve Fraser! SARA wishes you a happy new year and a productive 2018! We look forward to seeing you out at the launch range! NAR recently announced major changes to the structure of competition rules for the 2017 - 2018 season, and the result is that organizing and participating in competition launches will be much easier than in the past! In fact, it's now so easy to hold a competition meet, that every SARA launch will be a sanctioned NAR contest. And under the new rules, all you need to do to get on the NAR National Rocketry Competition (NRC) scoreboard is to bring a model, and one our SARA members will help you try for a qualified flight! SARA has a number of members well versed in competition flying, including several long time competitors and coaches, the author of the new NRC rules, and a Junior National Champion! (Zachary Cramton, shown here at NARAM 58 with his 1st Place C Parachute Duration and 2nd place 1/2 A Superroc models). Contest flying is a great way for kids and adults to have fun and expand their horizons, and SARA has the experience to help you learn more! If you think you might want to give one of these events a try, by all means, come out to any of our launches and give it a try! 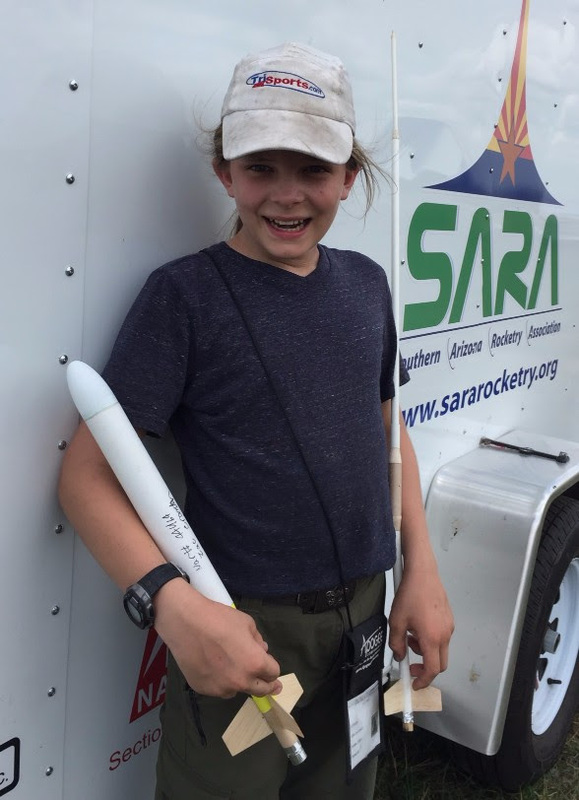 To officially enter the competition, you need to be a current NAR member 7 years or older, but SARA is happy to help anyone who wants to give competition rocketry a try with help, encouragement, and an unofficial entry. Feel free to come out and ask questions! It was a beautiful day out with some light wind, but very nice overall. We had a pretty good turnout to the point we had to turn on the second set of low power pads. There will be no Flickr album this launch as our favorite photographer was out of town. The star of the show was Andrews dark matter K. Thanks to all that came out, and Steve for running the range.